Over the last few weeks concerned activists have been gluing the locks of two businesses, involved in perpetuating the oppression of both animals and environment. 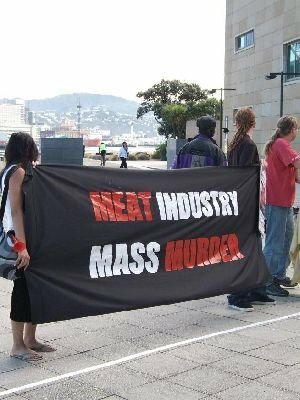 The Bank of New Zealand and the Mad Butcher have been targeted for their involvement in the Meat Conference, being held in Wellington this 30th and 31st of March. The agriculture industry is responsible for the brutal murder of millions of animals every year. Animals exist on this Earth for their own reasons, not for humans to dominate and exploit. Not only is this industry killing animals but the environment is also suffering. Effluent and runoff from dairy is poisoning our waterways and agriculture is destroying our topsoil. Agriculture is the largest contributor to climate change in Aotearoa, the methane and nitrous oxide emissions amounts to 51% of our greenhouse gas contributions. It is widely accepted that climate change will cause the collapse of entire ecosystems and it will drive over one million species to extinction over the next few decades. Businesses profiting from death must be stopped by any means necessary; this is just a small reminder that we are watching and their end will come! Can you believe these loonies? Criminal activity justified by nature worship, bogus environmentalism, climate change myths and self righteous messianic saviour complex. Proof that lack of animal fat in the human diet leads to brain dysfunction. Let's assume that libertarianism (the political doctrine to which you subscribe) is premissed on the idea that human beings have certain inalienable rights. Evolutionary theory tells us that there is no vast gulf separating human animals from non-human animals. So it's plausible, at least, to suppose that non-human animals also have certain inalienable rights - including, perhaps, the right not to be killed and eaten. I think it would be closer to the truth to say that the activists above seek to justify their activism on libertarian and scientific grounds - not "nature worship". Richard-Hierarchy is a very important part of my world view. I believe that certain life forms are superior to others and humans are far and away suprerior to any other known life form. Animals are here to serve us if we wish to domesticate them, make them into pets or stews. I think there is a huge gulf between animals and humans. Even the very highest animals-cetacaens, apes, dogs and pigs in no way approximate human capabilities. However as a libertarian, I grant you the right to put your dog before your daughter, your monkey before your mum, or your wombat before your wife. ie braised, fried, roasted, sauteed or casseroled. Criminal activity justified by nature worship, bogus environmentalism, climate change myths and self righteous messianic saviour complex....and trendy lefties without a constructive hobby ! Actually Trev, there are a lot of very real health and environmental arguments in favor of vegetarianism. And, when juxtaposed against issues of the increasing human population, these become even more important. I have spent a large part of my life as a vegetarian, and I can also attest personally that one simply "feels better" without meat. At the least, reducing one's meat consumption down to a bare minimum decreases potential heart disease and cancer. And hey, its Passover: Pigs ain't kosher! I agree with most of your views Trevor, but this is one that I strongly disagree with you on. Just because humans may be superior in certain attributes in no way gives us the right to determine whether another creature should live or die. There is no reason why we cannot eat the meat and use products from animals that have died naturally. I think that a true libertarian should value and respect all creatures’ choices, not just humans. I’m pretty damn sure that it is those creatures choice to live, not die. I agree however that the climate change bs they are talking about does nothing but weaken their argument. Animals are here to serve us if we wish to domesticate them, make them into pets or stews. Says who? God? I think there is a huge gulf between animals and humans. This view became untenable in 1859. In any case, humans are animals, so there can be no gulf between them. Humans are not animals-they are human beings. Humans have capacity for thought, spirituality and free will that most animals almost entirely lack and even the highest possess in tiny amounts. The fact that humans possess bodies that have common DNA with other species bodies means absolutely zero. Humans are in an entirely different class. We are sentient beings. Sheep and chickens are not. Even if humans were animals, we are as far above the rest as gorillas are to frogs. Rights are inseperable from responsibilities. Humans have more rights than animals because they can assume more responsibilities than our furry brethren. Not quite sure why I'm arguing this really, its a bit like arguing the case for gravity or the law of cause and effect. I find it hard to comprehend that intelligent people think we are the equal of woodlice and frogs. If people think that bunnies are their equal they are probably right. If you don't want to eat our furry and feathered friends-don't. But don't expect others to put themselves on an equal plane with cows, pigs and oysters-yum. Sorry, Trevor, we are bipedal primates belonging to the mammalian species Homo sapiens in the family Hominidae (the great apes)... in the phylum Chordata... of the Animal kingdom. Or are you in complete denial about the fundamental tenets of modern biology? Above? Measured in... metres above sea level? You seem bewitched by the metaphor of altitude. The idea that humans are somehow "at the top" of a moral hierarchy with other animals below is a vestige of pre-Darwinian thinking. In fact, we must be below our ape-like ancestors, since we're descended from them. Of course sheep and chickens are sentient beings. They are aware of, and respond to, their environment. They feel pain. What more do you need for "sentience"? As Jeremy Bentham said, "The day may come, when the rest of the animal creation may acquire those rights which never could have been withholden from them but by the hand of tyranny. The French have already discovered that the blackness of skin is no reason why a human being should be abandoned without redress to the caprice of a tormentor. It may come one day to be recognized, that the number of legs, the villosity of the skin, or the termination of the os sacrum, are reasons equally insufficient for abandoning a sensitive being to the same fate. What else is it that should trace the insuperable line? Is it the faculty of reason, or perhaps, the faculty for discourse?...the question is not, Can they reason? nor, Can they talk? but, Can they suffer? Why should the law refuse its protection to any sensitive being?... The time will come when humanity will extend its mantle over everything which breathes..."
I've suspected you've been "taking the piss" from the start Richard. God knows why-I would have thought libertarians would have at better things to debate on whether we are the moral equivalent of woodlice etc. If you think that is your lot in life-my sympathies-I have a higher opinion of both myself and humanity. DO you doubt that mammals (cows, sheep, dogs, cats etc) are individuals who are capable of feeling pain and are self aware (sentient). Presuming you agree, and presuming you agree its no great bother to choose a vegetarian meal rather than a meat one, isnt it better to eat the food that causes the least amount of suffering? I'm not going to suffer much if I choose beans instead of a steak, but my choice makes a pretty big difference to the cow. Richard asks:"what more do you need for "sentience"? Leaving aside the Latin root of the word,IE;Sentire:to think,How about this;Most adult humans are not only aware(of surroundings,light,heat,others,etc,etc)but are also aware that they are aware,this self reflective faculty is a Spiritual quality,and is what distinguishes Human beings from animals. my cat is aware that she is aware. she likes looking in the mirror and she knows its her looking back, not another cat. A pig or a dog or a cow could do this too, only it would mess up my hallway. 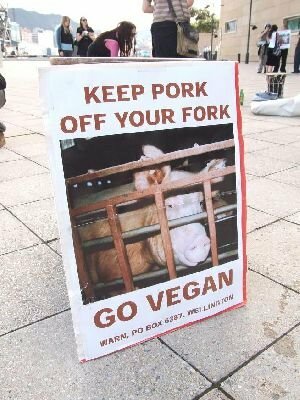 mammals are all sentient, self aware, etc and want to avoid pain and avoid being eaten. So I dont eat them. easy. may i ask exactly how you know that "she knows it's her looking back,not another cat"? No doubt cats are aware,and we can all learn from them,especially the way that they keep their attention so obviously in the present moment,but as for self-awareness,no. THERE is an iconic scene in 2001: A Space Odyssey when a caveman takes up a bone and uses it as a weapon. It portrays a pivotal moment in human evolution, and while the film is fiction, it has long been believed that we are the only animals that use weapons. Not any more: chimpanzees have been found using spears to hunt bushbabies. It is the latest in a long list of supposedly unique human behaviours and abilities that have been discovered in other animals. Whales apparently have empathy, baboons and chimps can demonstrate abstract thought, chimps and elephants can recognise themselves, scrub jays have foresight and chimps a basic sense of morality, or justice. What about language? Chimps and monkeys have an extensive "vocabulary" of calls, and whale song has a grammar with a hierarchical syntax. The ability to understand what another individual is thinking is well developed in human. We do it better than chimps, and chimps are better than monkeys. In these cases, our abilities are more sophisticated, but they are not qualitatively different; we are at one end of a continuum. Should we grieve for the loss of our uniqueness? Not at all. We should not expect to be radically different from other animals, after all, we evolved from a common ancestor and adapted to our environments. In the case of humans and chimps, that ancestor did not live all that long ago, evolutionarily speaking. Removing our sense of uniqueness is to be welcomed. It might give us a stronger sense of connectedness to the rest of life, boost conservation efforts and might even remove some of our "unique" intellectual arrogance.